Today we know very little about Spartacus the man – partly because contemporary Roman historians were keen not to eulogise his successes. This of course is grist to the novelist’s mill. 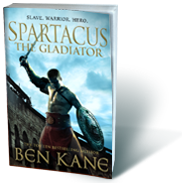 Ben Kane’s latest novel begins in the Thracian village to which Spartacus has returned, after serving as an auxiliary in the Roman army. He quickly falls foul of his overlord, the tribal king, who has set his heart on Dionysian priestess, Ariadne – later to become Spartacus’ wife. Betrayed to the Romans by his jealous king, Spartacus – and with him Ariadne – are taken in captivity to the gladiator school at Capua. It is from here – against the unbelievable brutality of gladiatorial life – that Spartacus and Crixus the Gaul plan their escape to Vesuvius, where they recruit and train a huge slave army. An army which will keep the might of Rome at bay for two years and create one of the most extraordinary legends in history. Will you continue to write Roman novels? or would you try something different? I have always found the Times of Clovis or Charlemane around the 8-9th century of great interest as it is almost pre-history, this would give you almost unlimited license to create a tail of your own imagination. As for new novels, well, I will be pitching to my publishers for a new contract some time this year. I have lots of ideas up my sleeve, but if I told you them, I’d have to kill you. 😉 For the forseeable future, it’s Roman, but I do have other time periods in mind as well. Not Wars of the Roses any more, however! Hi Ben – nearly at the end of your first book – decided to go straight to Startacus on Audiobook – looking forward to starting that in the next few days – great writing and well done on the No.3 bestseller! @Mightywhite: Thanks a lot for your good wishes. Very pleased that you like The Forgotten Legion too! Just wanted to say how much I enjoyed “Hannibal”. I am so glad there will be more to come in this series. This is the first of your books I have read and thoroughly enjoyed it. Spartacus next I think. I’m 3/4a the way through Spartacus, haven’t read a page in over a week, I’ve got a few days off work and have been saving the book for then, I’m getting withdrawal symptoms. But really looking forward the the new books coming…. Keep up the GREAT work Ben. Hi Ben – that first weekend in June at Chester promises to be a cracker! I’ve already had people getting in touch with me about it, and if they’re as excited as this about it already , I’d love to know how it would feel in 2 months’ time when we all gather there! I know that you and Ruth will be there again, and it’s good to see that this time Tony and Manda will be there as well. Something to really look forward to, have a good Easter and best regards, Mike. @Mike: yes, it should be good! Happy Easter to you too. I have read all of Conn Igguldens books on the Mongols and Caeser they are great books. However I purchased all three of your books on the forgotten legion and sadly read them solidly for three days until I’d finished them. Gripping to say the least and they really put you in ancient Rome. It’s made me want to visit Rome next year in pursuit of some real Roman history. On another note your last book leaves Romulous looking east with a view to go and find Brennus can I assume I’ll be parting with some well spent cash on a future novel with Romulous and Co? @mini4q2: Thanks very much!I hope you get to Rome soon. If you have a look elsewhere on the site, most likely under The Forgotten Legion, you’ll see that I have no plans to write another book about Romulus. Sorry! Just letting you know Ben, I’m sorry to tell you I won’t be in Lincoln next week. My car’s being MOT’d, and although I’ll have got it back by then, I’ll be using it to play catch-up on things. The good news though is that I’ll still see you at Chester when you join Tony and Manda. Kelmarsh I’m in two minds about, but what is certain is that even if I’m not re-enacting, I’ll still be seen drawing pictures at the festivals with a chance I can get some commissions, and as the summer develops, there’ll be some more pictures of the Roman army in action on my website. Last year people were only just getting to know me, but with me now having a profile stretching across no fewer than 60 countries thanks to Twitter and FB, I should get a few commissions. What I’ll enjoy most is talking to the visitors about my works. I’m glad Tony’s big night went well, it won’t be long before I read TLS, but what’s stopping me at the moment is that (of all things!) I’m reading Spartacus! Anyway, I must carry on with my project now, best regards, Mike. Just finished reading the forgotten legion trilogy and I must say… Wow! You’ve left me on such a cliff hanger! Your wording and use of historical events was great! I especially loved the reason why you changed 27th to the 28th legion in Alexandria! I hope you can also rerun my email 🙂 Cheers, Lee Worrall. @Mike: Lincoln’s off, Mike, so glad you can’t make it there! I’ll be in Cowbridge instead, with Tony. Glad to hear that your projects are bearing fruit. @Personification/Lee: thanks for posting, and welcome to my site. Glad you’ve been enjoying the books. Will reply to your email asap. Thanks for your info Ben. Cowbridge! I thought I’d heard of it! It’s in South Wales and I’m no stranger to that area. I graduated just down the road in Swansea with a degree in Visual Arts in 1996, and the outer Severn Bridge was only just being built then. Back to 2012, and despite my wish to be with you and Tony in Cowbridge it looks doubtful, but I hope it goes well for you both. Thanks also for your wishes – I now already have an art commission (a portrait in Roman armour) which I’ll be starting this week. I’m working on both posed pictures as well as action scenes such as the operation of a ballista, a gladiatorial fight, or perhaps an extract from the Battle of Teutoberg Forest. The works of Graham Sumner (whom I spoke to on the phone before last Christmas) and of Angus McBride have both inspired me with ideas for my project. I remember looking at Graham’s works on one of your old websites, and the works of Angus McBride are also well worth the look. If, Ben, you wish to find out more of this project, you’re more than welcome to do so. Best regards, Mike. @bassius: Thanks for your post, and I’m glad you enjoyed it! Spartacus – fantastic read – cant wait until the next book comes out in August – grrrrr 6 weeks still to wait. Another great read by a remarkable author – keep up the good work Ben. @denisehasty: Gosh, you read that quickly! I’m glad that you liked it so much. Only 44 days to go…hang in there! Hi Ben – thanks for your posts. It looks like you and me have been exchanging friends over the last few days! Whereas I got to know Peter Goh you did likewise with Titvs (Jose Sanchez Toledo). I have always believed the best thing the Internet has done is brought together so many like-minded people, thus intensifying our interests. I got to know Peter thanks obviously to TFL and Peter has already sent me an e-copy of his book which is very inspiring. There is a growing number of reports proliferating over any Roman presence in China, and there has also been recent evidence of traded Roman goods found in Japan! If you’re not familiar with that I will send you a copy of any report I’ve seen of that. Such reports of this are coming out, that they don’t just have links with the aftermath of Carrhae. Not having been anywhere in Asia myself I can only speak for that, but despite that, this is really inspiring. Titvs is a guy I’ve told you about before, and in Titvs, what you see is what you get. I promise you will enjoy having him as a friend. I’m already halfway through reading his book “Imperium Legionis” which was written in about 2004. The man is a genius – he lives and breathes Roman military life and re-enacts wherever possible. He has invited me to join him at the Emerita Lvdica in Merida (Extremadura – just west of Madrid), which is like Spain’s “Nimes” or “Kelmarsh”. It’s not till the end of September. I will also advertise the Casa Rural Romana just outside Merida. I won’t tell you of that – I’ll surprise you by getting you to click onto the website for it, and there is a page in English. You’ll enjoy looking at that I promise you, best regards, Mike. Well wow! What can i say!? I have always been a big reader, reading books of all genres and backgrounds. This book is definatley one of my collection that will be read again and again. I couldnt put it down! I loved how it didnt focus on just the one character as many books do, but that we got to see many peoples perspectives throughout the story. Although Spartacus is the lead and hero, i have an incredible soft spot for young Roman, Carbo, and i cannot wait to see where his story leads in the next installment. You may just have become my new favourite author! Looking forward to the next installment, in the meanwhile i may have to go out and buy your other books! Will you be doing any book signings for the next Spartacus? If so, anywhere near Leeds? 🙂 Would love to get a signed copy. my mom is a huge Fan of yours shes wondering if you have Spartacus ; Rebellion in spanish or Hannibal spanish. shes in love with all your books she has read all of them now she wants the new ones. pls let me know soon all pre order and pay whatever price for them. @galiciad: Spartacus and Hannibal have not yet been translated into Spanish. Lo siento. They will be soon, however. Keep an eye out on the Ediciones B website. Just finished Spartacus the Gladiator which I thoroughly enjoyed. It was in the fast-moving style of Bernard Cornwell which made it almost impossible to put down. I can’t wait for the second book in a few days. However, I’m wondering whether I will read it with a slight feeling of dread, rather like watching the film Titanic. However well things appear to be going for our hero, I know it won’t end well! By the way, does ceasar68 realise that they’ve spelt “caesar” wrong?! @msyers: Thanks for your post, and welcome to my site! It’s great that you enjoyed Spartacus so much. Yes, the ending is sad – it drained me to write it – but there’s something to take out of it that is uplifting, or so I hope. No idea about caesar68 – it’s a very common misspelling, though! I hope the launch went well last night Ben. I’ll get back to you on that – busy at the moment. Cheers. Mike. It might sound strange, but I’ve Just started reading this after Spartacus : Rebllion, and so far It is REALLY GOOD! Thanks for the time keeping me off the Video games!! @Riki Norarangelo: Glad you’re enjoying the books, even if they’re back to front! Stay off those video games – try Douglas Jackson, Anthony Riches or Russell Whitfield next for more Roman military novels! Thanks Ben, I’ll Look out for Those guys! I must say I came across your book completely by chance, but now you`re one of my favourite authors! I have just finished reading Spartacus The Gladiator and it is a great piece of writing indeed! I love your style (just to make it clear- I read it in English) and the way you create your characters. Somehow I feel they`re alive and find it easy to relate to them. I still don`t understand how you do it, but even though I know the story of Spartacus I still found the book captivating to the very last page. Moreover, I`m going to buy the second book about Spartacus as I am sure it will be equally well-written! And here`s the question about something I am really now aware of. I hope you do receive payment when your book is sold in another country e.g. like Poland? I am going to buy your book in one of the chain bookshops, because I think good authors should be supported and encouraged to write more! @Lukas: Hello, and welcome to my site! I’m very glad that you found my book and enjoyed it so much. In these days of piracy and illegal ebook downloading, it is SO nice to have someone like you enquire about whether I get paid for a foreign sale such as yous! The simple answer is I don’t know, but if it’s a real book that you bought, then I probably will. Thanks a lot, Lukas and I hope that you enjoy Spartacus: Rebellion. Best wishes – Ben. @Ferbie1211: Apologies for the delay in replying. I don’t quite understand the question, sorry. Ping me an email with more details, could you? Ta. @tartandave: Sorry that it’s taken so long to reply, especially considering what you said! I’m glad that your time being ill was made somewhat easier by listening to the trilogy. I also hope that you’re fully recovered now. No book four of the Forgotten Legion, I’m afraid. So many other stories in my head! Excelente el libro, gracias por darnos estos momentos de buena lectura. un saludo. Is there going to be a book three to spartacus? I’ve always loved the story of Spartacus and I came across your books that tell the story brilliantly. I am now an avid fan! I mainly read ancient Greek and Roman stories and find your roman ones very inspiring, I’m currently attempting a story of my own, for my own interest not with ambitions of a best seller 🙂 I am only about a 3rd of the way in but sometimes wonder what you’d think of it! It’s a story of ancient Greece but living in Somerset it’s hard to find the inspiration, thinking I need a trip to Greece! Hi Iain, and many thanks for your message. It’s great to hear that you enjoyed the Spartacus books so much, and that you are enjoying more of them as well. Don’t let living in Somerset stop you – I live in the county too – Google Maps is your friend. Best of luck with your writing! Ben.